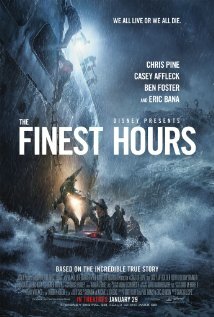 The Finest Hours is about an oil tanker ship split in half in 1952. Two ships in fact are in the same situation so while one is being saved the other is relying on hope that a radio signal gets through for a rescue operation of their own. A team of four coast guard members are sent out by their chief, Daniel Cluff (Eric Bana) — a transfer from Texas who doesn't really know the waters. Everyone in the station is telling the four crew members they are going out to their deaths and that it's not worth it but Bernie Webber (Chris Pine) is haunted by his past failures and refuses to give up on those men. He is accompanied by Richard Livesey (Ben Foster), Andy Fitzgerald (Kyle Gallner), and Ervin Maske (John Magaro). Together, they face a storm and walls of waves 30 to 60 feet high to reach the stranded ship. Bernie has just been recently engaged with Miriam (Holliday Grainger) who isn't afraid to speak her mind to the chief and ask him to call back Bernie and his crew. After she gets removed from his presence, all Miriam can do is hope her fiancee makes it back safely and alive. I recently read/heard some reviews that didn't like the Boston accents portrayed but I didn't notice anything wrong with them. The story, graphics and acting was superb. The huge cast was amazing. The Finest Hours is truly inspirational and worth your time. Good job to Disney for making yet another amazing movie.